Tridexx’s all in one design with HMI for blender and material handling make it the most compact blender controller in the world! Touch Screen and multi language available. 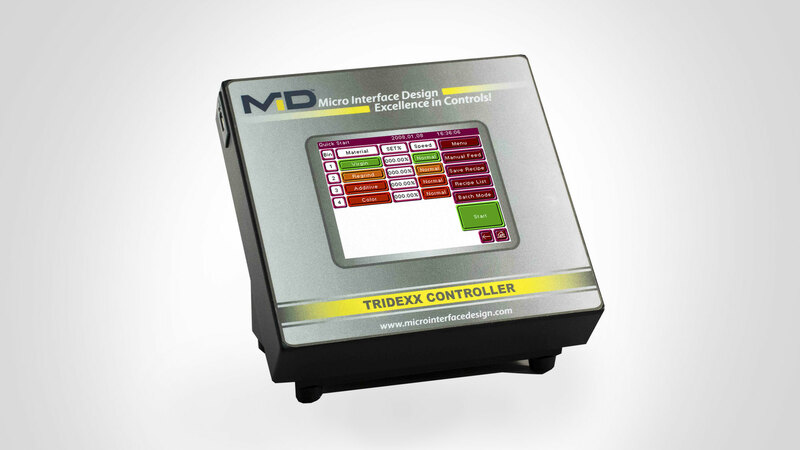 TRIDEXX™ from MID is designed for simplicity and very user friendly operation. Tridexx’s all in one design with HMI for blender and material handling make it the most compact blender controller in the world! All the IO’s necessary for a blender up to 8 ingredients, 8 loaders and one vacuum pump is available in one box! The large easy to see buttons and numbers on the touch screen make it easy to operate in all types of light conditions and ensures the operator has a large button area to make changes or adjustments in the operation of the blender. The Tridexx controller operates vibratory linear feeders, slide gates, pinch valves and mixed. Tridexx is the artful mix of simplicity and utility while maintaining a leading edge in control technology.